Writer Doctor Avinash Kumar is a senior Doctor in Government Hospital of Delhi. He has filed so many cases against corruption. A question raised in his mind that None of the individuals accepts his own malpractice and everyone wants corruption free country, then who is the culprit of Corruption in India? When all the employees of all sectors, organizations, institutes, the general public are honest than to whom they wish to fight? When each and every person is honest in India then why India is in the list of corrupted countries? 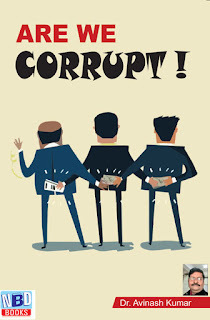 Corruption is a highly complex and diverse phenomenon with many different manifestations. It can be incidental, systematic or non-systemic, large or small. It can be judicial, administrative, legislative or political in nature. It occurs in the public, private or civil society sector. It can involve groups or individuals. We can say that corruption is like a 'cancer' of an advanced stage which cannot be eradicated but can be cure by doing a few strict exercises including 'self-assessment' while performing our duty.